Family exercise is an important part of childhood: teaching your little ones healthy habits early. Global Running Day is June 1 this year. It’s always the first Wednesday in June and it’s always a great day for a run - no matter what the weather. It is a self proclaimed day “for people around the world to celebrate the joys of running.” Runners are encouraged to share their passion for the sport and to encourage and inspire others around them to take part too. Go ahead and pledge to get involved! It will be fun! 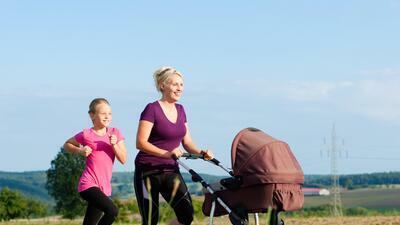 Family exercise is an important part of childhood: teaching your little ones healthy habits early. Running is of those sports that kids can carry into adulthood very easily. Major league and even minor league sports such as football, softball and soccer are extremely competitive and exclusive - very few kids’ dreams will come true of getting into these leagues. There are plenty of casual softball and soccer leagues around but not everywhere. However, any weekend of the year, you will be able to find a local road race for competition (find them at Runner’s World, Running in the USA, Road Race Runner or many more). Most cities also have some sort of grassroots running club for camaraderie and teammates (find yours at Running In the USA). Running is an activity that requires little to no equipment (beyond shoes), can easily defeat childhood obesity! As a parent, you may be wondering when to start to encourage your children to start running or how far your ten year old should really be able to run. Little kids really run a lot! No need to encourage them to stay active, right? That being said, they should not be running more than short kid’s races up to a few hundred yards. They won’t have the coordination and a mature running gait until they’re in grade school. It’s good to invest in proper running shoes for even these short races. Encourage your littles to play tag, run up hills and go for short bursts of speed. By age seven or so, kids can start to run up to a mile (or two at the very most) after plenty of training - and in good shoes. You really want to be sure they are happy doing it and not in pain. Encourage them to take walk breaks as often as they want and drink plenty of water. This is a great time to introduce your children to the local track - four laps around is a mile. They’ll love how official it is and how the track feels under their shoes. Your ten year old may be ready to join you on a 5K race (3.1 miles)! Again, as long as they’ve worked their way into it and are comfortable with the distance. Experts agree that speed over distance is best for kids in this age group. That’s why hurdles and sprints are so popular in middle school track teams and why cross country teams typically run shorter races than high school teams. If they are running too much, growth-related injury may occur. Kids are still growing - their leg bones included. Too many miles at this age can be uncomfortable due to cartilage not yet matured into hard bone. High schoolers are finally mature enough to start running long distances. High school teams are often more rigorous and practice more often than those in middle school. Encourage your teen and her coach to employ cross training and weightlifting to reduce overuse injury. Teenagers are capable of joining you on a 10K (6.2 miles) race or even half marathon (13.1 miles) but probably not yet a marathon (26.2 miles). Again, teens are still growing, including muscles and bones. So get out there with your kids on Global Running Day. Ask them to join you on a run around the block, on a training run for your next 5K or just race you to the mailbox. Just be sure, it’s an age appropriate run! Last year, my then three year old and I went on a quarter mile jog/ walk on our local Metropark trail. I expect we’ll go a bit farther this year. Are you a runner? Do your kids run with you?